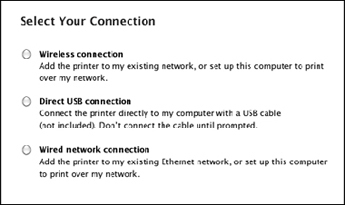 In the Print & Scan, Print & Fax, or Printers & Scanners window, select your printer, then click — to remove the printer. Click +, select your printer, and click Add to add the printer back on the printer queue. Then try printing. If you can print, you don't need to continue troubleshooting. You're done. 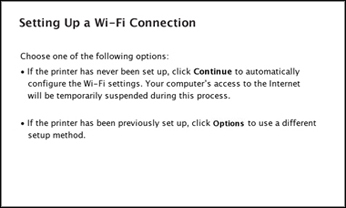 If the Wi-Fi icon is on, follow the instructions in the Initialize Your Router and Restart Your Computer section below. If the Wi-Fi icon is off, follow the instructions in the Reinstall the Product Software section below. On your Mac, open the menu and select System Preferences. Then click either Security & Privacy or Security. Select the Firewall tab, then disable the firewall. Open the file you downloaded and follow the on-screen instructions. When you see the Select Your Connection screen, select Wireless connection, click Continue, then follow the on-screen instructions. When you see the Select Setup Option screen, select Set up printer for the first time, click Continue, then follow the on-screen instructions to complete the installation.